With the exhibition "Unbuilt City", we are pleased to be able to present the second solo exhibition by the Düsseldorf photographer Thomas Neumann in the gallery. The word "utopia" can be derived from the Greek "eu-tópos", meaning something like "happy-place", as well as "ou-tópos", which can be translated as "no-place". Thomas Neumann traces this terminological ambivalence in relation to planned, built and unbuilt architecture. As already in his series "Pictures from Utopia" (2003-2005), a pictorial analysis of the socialistic planned city Eisenhüttenstadt, the new series "Unbuilt City" also makes use of found pictorial material. This time he finds it in the archives of Dresden's city planning. 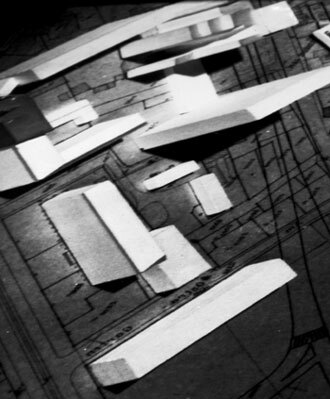 Inspired by the current urbanistic development of Dresden's inner city, he set out to research the city planning of this area in the 1950s when it needed to be largely reconceived following Dresden's destruction in World War II. During his research, he came across a mass of unrealised plans. The Prager Straße was planned in a variety of designs, sketches and models, as a pedestrian high street. In these designs, the late modern - even in the German Democratic Republic - asserts itself against the purveyors of historical reconstruction. The documentary material from this period is still available as black and white negatives or prints. Thomas Neumann digitalised this material to produce prints in A3. He then photographs these prints in analogue, using the camera to make a virtual exploration of the model city. "I can't enter into the photo. I try to go into the model that is no longer there. I would like to take a walk in the model. I photograph flat and at angles to get the perspective of a pedestrian." This results in large black and white photographs with extreme contrasts - abstract and disorientating due to the perspectival distortion. The prints are fixed with magnets to metal sheets, and through the spontaneity of the presentation become utopian designs again - a picture of a picture as analytical and critical method. Formally, the new series of photographs can also be seen as an extension of the work "Distortions" (2005). Already in this work, fantastic buildings seemed to float in the pictorial space - and were only re-photographed and digitally altered construction-site signs or simulations of architectural designs from Shanghai. Thomas Neumann, born 1975 in Cottbus, lives and works in Düsseldorf and Tokyo. * This work is not part of the exhibition but will be happily shown in the gallery on request.